RPL currently works providing office seating foam for some of the most innovative and design inspired Office Seating Manufacturers in the UK. We supply all of the office seating foam component parts to enable the Office seating manufacturers to produce some truly inspiring designs. The traditional office chair is still a major player but sitting along side the traditional are some innovative seating and office dividing seating areas. These office dividing seating areas are flexible in the fact that they divide the office areas to enable privacy where needed and provide a modern looking seating arrangement – a great dual purpose product. Also the benefit of this type of seating is that it can be easily moved around to accommodate different group sizes or even multiple groups where more than one event is needed at any one time. RPL can provide all of your office seating foam requirements from seat pads to ‘peeling’ foam sheets which are used extensively in office dividers. RPL are one of only a handful of manufacturers in the UK who own and operate a peeling machine. The advantage of a peeling machine is that it can ‘peel’ a block of foam to form a continuous roll of foam which can be only a few millimeters thick. The office chairs have also received a revamp of design using mesh backs and neon colours. 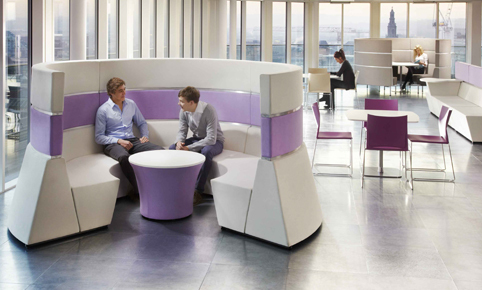 RPL are able to assist you in any type of Office seating foam you require. All of our foam is British made and meets Crib 5 fire standards. To achieve different office seating foam comforts we have a modern fabrication department who can fabricate different grades of foam together. If you are unsure of the grade of foam required then we have a team of foam experts ready to help and advise. RPL the one stop solution for your Office seating foam. Sed posuere consectetur est at lobortis. Donec id elit non mi porta gravida at eget metus. Aenean lacinia bibendum nulla c onsectetur. Morbi leo risus, porta ac consectetur.